photo by Barry Richards, #1 fan, sherpa and race photographer! There I am - jumping over the finish line at the 2012 Ironman Muskoka 70.3. My longest and toughest race thus far. My finishing time was 6:21:36 (I started in the 4th wave, 18 minutes after the first start). 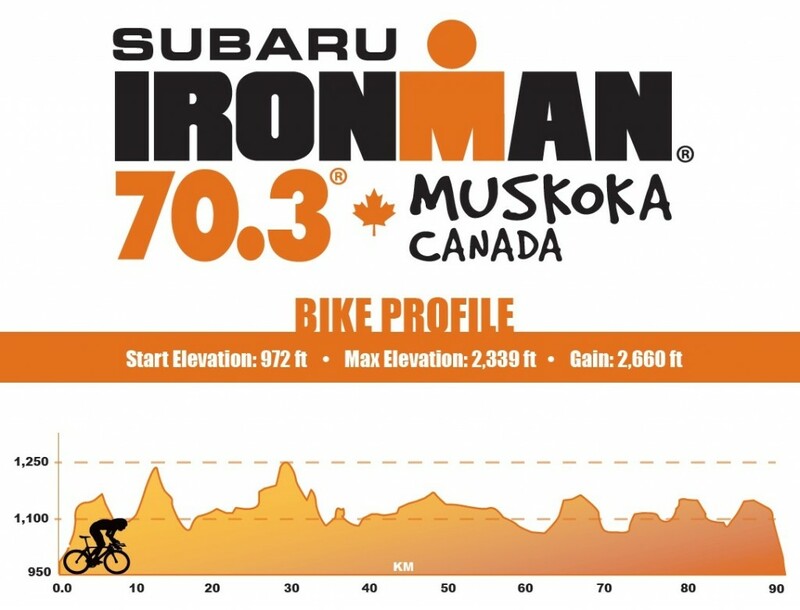 This race was not on my original 2012 race plan but I wanted to race one more half iron before Ironman Florida and a bunch of my new friends from the Toronto Triathlon Club were racing so why not. Barry and I arrived at Deerhurst just before noon on Saturday. It poured rain all night Friday night and Saturday morning and on and off all Saturday afternoon. The drive up was pretty easy and we were able to park at hotel registation since we were staying at the resort. We took advantage of that parking space and checked in and shopped a little. Check in went very smoothly with no line ups at all. I was disappointed the only thing I really liked for the Muskoka gear was the jacket but there were no more smalls and the medium was way too big. Come on - there has to be a small in here somewhere! I hope I don't regret not buying a shirt with my name on it! I ended up buying the Muskoka 70.3 bike jersey, an IM 70.3 sticker and a pair of 2XU compression pants. I have worn the compression pants every day so far! After we finished up at the shop, I racked my bike, dropped our stuff at the condo and then went off to visit some friends at their beautiful cottage on Lake of Bays. After a little visit, we returned to make sure everything was good at transition and then were off to dinner with the TTC mates who were racing too. Deerhurst really did a good job welcoming the athletes! I slept like I do before every race. Waking every hour or so to check the clock, tossing and turning and finally getting up before the alarm and wake up call. I was up around 5:45, making coffee and getting my stuff ready to head down to transition. Our condo was close to the swim start so I planned on setting up my transition and then heading back to condo to stay warm and get ready for the swim. The sky was beautiful as the sun was coming up while we make quick work of setting up transition. I was lucky I had a good spot that did not get crowded or moved around throughout the day of bike racking. It was about 8*c, 47*f and I wasn't sure of the conditions so I had options at transition - my windbreaker, my arm warmerss and my little arm jacket. I also had a full size towel to dry off. I did not want to be cold on the bike. I also decided to swim in my sports bra so that I would start the bike in a relatively dry top. This makes for a cluttered transition space but I was planning on taking my time in transition anyway so I wasn't worried. Shortly after 7am I was all set at transiton and made my way back to the Condo. I had invited anyone who wanted to come back to get warm and Chad joined us. Unfortunately Barry took a photo detour and when Chad and I arrive at the condo my key didn't work. I was dressed fairly warmly but poor Chad was just in his racing suit! Barry came to the rescue shortly and we were sitting in front of the fire place warming up and waiting. Time moved pretty slowly for the next 45 minutes and then we were in a bit of a rush and a panic to get our wetsuits on and down to the water. It was actually perfect timing. We arrive just as Chad's wave was entering the water but the wave before his hadn't gone off yet. My wave entered the water about 12 minutes before our start time. I was happy to find Irisz and Myndi to keep me company. The wave was fairly small and I decided to head out to the far buoy since we were keeping the buoys on our right in this rectangular swim and positioned myself towards the front. The water was murky but the perfect temperature. I knew it would be a nice swim! I felt like I had a great swim. I got my ankles grabbed a few times and one time I hit a lady on my left and felt really badly for it. But I focused on my bilateral breathing and my strokes and felt like I was going to have a great split. I was disappointed to hear Barry shout to me 40 mins on my exit but I'm pretty sure the swim was really 2.2k and not 2k - 200 meters and 2min/100m is 4 mins which would have given me an awesome swim time. I used the strippers (wetsuit that is) and I'm not sure they helped or not but I was feeling great. The sun was out and it was getting warmer. It was going to be a beautiful day to bike that 94km ride. Not too cold, not too hot ... my head was spinning as to what to wear on the bike... decision on the fly are not the best! The run up to transition was long (300 - 500m depending on who you asked) and UP HILL ... I ran, I jogged, I walked. I was trying to judge the weather and made the decision to just go with my green jersey and leave the jacket and sleeves behind. I had 3 hours and 24 minutes to regret that decision. While I was never freezing, I would have been much more comfortable with my arm warms or my arm jacket. too many choices ... I wish I grabbed arm covers! As I was leaving my bike rack I noticed the back wheel rubbing. Luckily it was just the rear breaks which I easily adjusted. I was happy that not even a bit of panic set in when I felt something was wrong and I'm very pleased that I know enough about my bike now to fix minor problems! I was finally out on the bike after a very long 5:49 transition - which included the long uphill run up! I had ridden the bike course twice before in training so I knew exactly what to expect. Lots of short, steep climbs and lots of descents. There is one stretch of flat road along highway 35 but that's about it. The 94km course ends with a heck of a climb back up to Deerhurst. not much time to relax! The bike was pretty uneventful. I didn't push myself too hard, I tried to avoid drafting and snot. I was snotted on by 3 different men within the first 5km on the bike. It was truly gross. While I had carried enough hydration on my bike, I practised grabbing water and Perform bottles at the second bottle exchange. I also thought perhaps I would be able to relieve myself on the bike and the water would come in handy. As it turns out, no matter how much I had to pee, I could not make myself go on the bike! I missed the potties at the second bottle exchange and probably should have pulled off the road but ended up holding it until after T2. The final 6 km back to Deerhurst are quite a challenge but I pushed myself through and was so happy to get over the final climb and coast in on the the decent with spectators lining the roadway! You feel like a pro! Ahhh, time to get off the bike! I didn't want to take too much time in T2 as I knew I had to hit the potty before the run. But I had to get socks on my feet and that seemed to take me forever. My longest T2 ever at 2:35. Then I hit the potty - which I wish they would put inside transition so that the PP time would go on your T time and not your run time but no such luck! I'm pretty sure I was in the potty for a good 4 minutes! I don't think I sweated a bit on the bike so the 3 liters of fluid were needing to get out! I heard the announcer say the lead woman was coming in and I was in a hurry becuase the run out and the run in followed the same path and as depressing as it might be that the winning woman was finishing the race as I was starting my run, I was so excited to see her. I was lucky and ran right by her on my way out. I cheered loudly and it gave me a bit of a boast. Then I saw the water station right at the exit of the chute and I decided to stop for a drink. If I remember correctly I was just trying to get in the right mindset to run a half marathon and at this point I wasn't in any hurry! I stopped, I drank, I ate a couple honey stingers and chatted with the volunteers! Then I set off to run my half marathon. I mustered every amount of positive energy and gave a big smile and thumbs up to Barry! It's always easier with a smile on your face! But really, this does not do it justice! It was hill after hill after hill.... I walked the aid stations and strugged with stiches on both of my sides until I realized it was when I took water that I got the pain so I stopped talking fluid and didn't take any until around the 13km mark. Then I took pepsi. I decided that since I have been told I will take cola on the the full ironman, I might as well try it in training. It was flat and warm ... and I took it 3 times on the run! It was really a wonderful thing ... who knew!!!!! I made sure I thanked all the volunteers and spectators as much as I could. Though I did snap back at one lady who told me I was almost there at the 15k mark. No, no I'm not. I have 6 more kilometers and that could be as much as 36 more minutes! I was not almost there. But the very cute OPP officer who told me I had 1 kilometer to go - I could have hugged him! I kept a smile on my face through out it all! Coming up the finishing chute! Happy Girl - with medal on backwards! I have to say I'm very happy with how I executed this race. I focused on good technique in the swim, I nailed my nutrition and hydration on the bike, and I persevered through the run. I was 20th out of 48 in my age group, so all things concidering - that's pretty darn good! But I must say, I'm not sure I would ever run this race again ... but I have learned to never say never! CONGRATULATIONS, LINDA KAY, ON YOUR FINISH! Next Stop November 3, 2012 - Ironman Florida! Thanks for this play by play. I just signed up for the 2016 version. Gotta train for these hills! Week 10 training update: 6 weeks to IMFL!!!! Week 9 Training update - 7 weeks to go! Week 7 Training Update: 9 Weeks to go!